KARACHI: Pakistan lodged on Friday an official complaint against India at the United Nations, accusing it of “eco-terrorism” over the recent ‘air strikes’ that damaged several trees in a Khyber-Pakhtunkhwa village. Government of Pakistan (@pid_gov) officially reports to @UNEnvironment about Indian air force strikes on Pakistan's nature reserve forests #BillionTreeTsunami and damage to environment. The trees were destroyed as “payload” fell over Jabba village near Balakot after Indian Air Force violated Pakistani airspace last month. While India claimed that a large number of Jaish-e-Mohammad (JeM) militants were eliminated, villagers pointed to some splintered pine trees, and could see little other impact from the botched air strikes, which led to heightened tensions between the two nuclear-tipped states. “Pakistan values its natural assets, especially its trees and forests, and this brazen act [of assault] on one of the country’s precious and prized natural assets is nothing short of eco-terrorism,” reads Pakistan’s demarche submitted to the United Nations Environment Programme (UNEP). 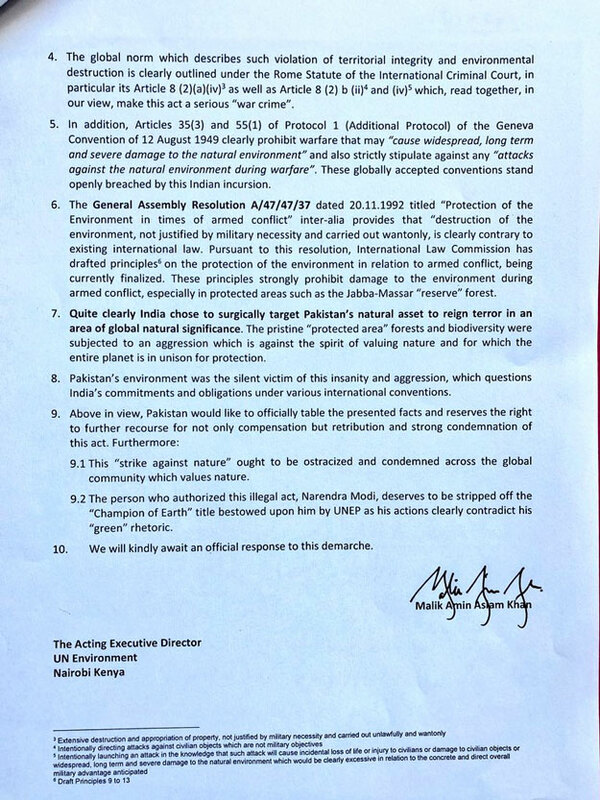 Islamabad’s dossier said that India had openly breached globally accepted conventions such as Article 35 (3) and 55(1) of Protocol 1 of the Geneva Convention of August 12, 1949, and General Assembly Resolution titled “Protection of Environment in times of armed conflict” which prohibit damage to natural environment during armed conflict, especially in protected areas such as the Jabba-Massar reserve forest. “This deplorable strike was clearly a strike against nature,” said Prime Minister’s Adviser on Climate Change Malik Amin Aslam while presenting Pakistan’s case at the Fourth Session of the UN Environment Assembly (UNEA-4) in Nairobi, Kenya. 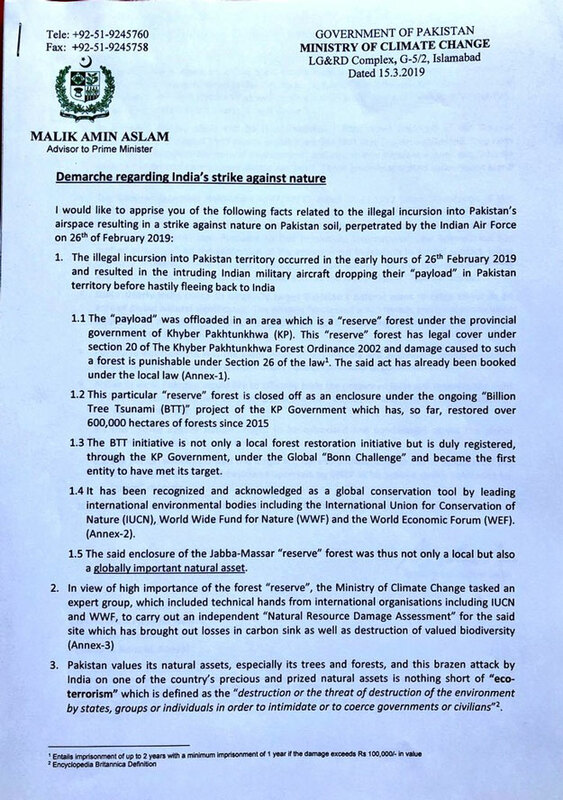 Pakistan, he added, reserved the right for taking further action and claiming compensation and retributions for this act, and was “raising [the violation] it at this forum to give a voice to the voiceless: the fallen trees of Masar-Jabba forest reserve which became the silent victims of the shameful attack on nature”. 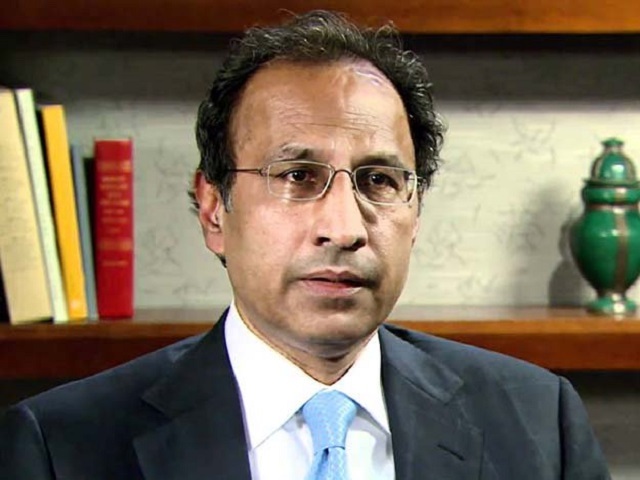 Aslam urged for an urgent need to strengthen international laws and commitments of the global community to take cognizance of such offences against nature. 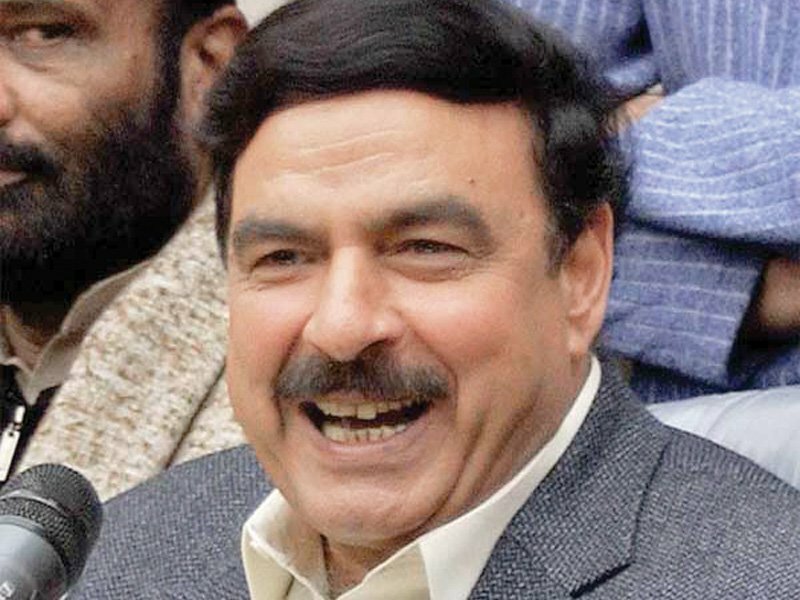 While Pakistan called for global condemnation of the “strike against nature” from across the global community which valued nature, it said that Indian Prime Minister Narendra Modi, who authorised the act “deserves to be stripped off the ‘Champion of the Earth’ title bestowed upon him by UNEP as his actions clearly contradicted his ‘green’ rhetoric”‘. “Any person authorising such a strike is not a ‘Champion of the Earth’ but belongs to the Earth’s hall of shame,” Aslam said. Earlier, the adviser outlined Pakistan’s efforts in carrying forward the agenda on sustainable consumption and protection in line with Sustainable Development Goals. 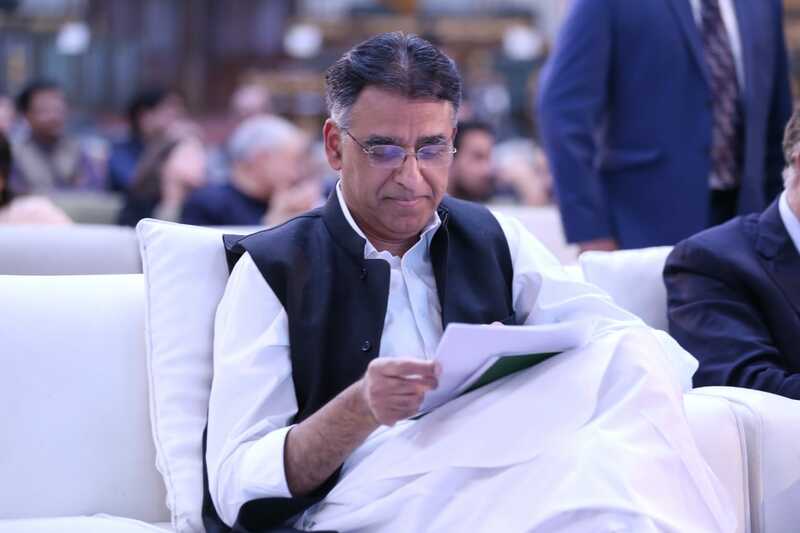 This green political will, he added, is also manifested itself in other areas including “increasing mangrove cover, focus on renewable energy, and also in the transport sector where Pakistan has just finalised a zero emission metro bus system for Karachi”. The adviser said that another innovative initiative called ‘Recharge Pakistan’ was in the works which aimed to turn the climate crisis into an opportunity “by diverting flood waters to restore wetland ecosystem as well as recharge our groundwater”.